I would like more information about 168 Silver Fox Drive. Log Cabin Living! 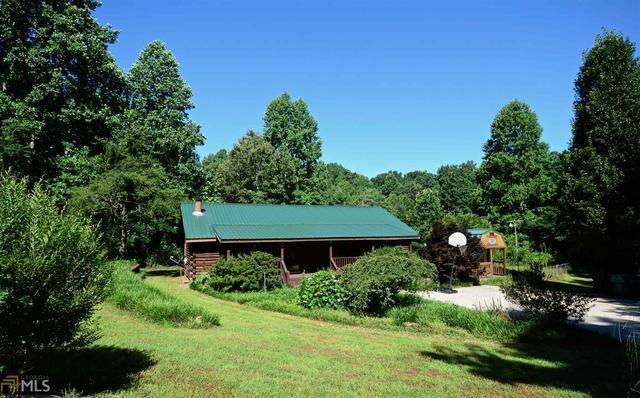 You will fall in love with this home that sits on one acre of land with its own one acre private fishing pond. An amazing open living room with cedar walls, ceilings and floors. Fantastic pdated eat in kitchen with all new stainless steel appliances! Kitchen looks out over the flat back yard. The Master bathroom has been updated. Farm styled living with a raised bed garden area, chicken coop, detached metal garage, and a quaint workshop! Directions: *GPS Friendly* 400 North towards Dahlonega, Right onto Henry Grady, Right onto Price Road, (Hwy 136). Cross bridge, take an immediate right to Toto Creek Road. First right is Silver Fox. Home on right at bottom of hill at curve. Listings on this website come from the First Multiple Listing Service, Inc. ("FMLS") IDX Compilation or Georgia MLS ("GAMLS") and may be held by brokerage firms other than Compass. The listing brokerage is identified in any listing details. Listings from the FMLS or GAMLS are for the consumer's personal, non-commercial use and may not be used for any purpose other than to identify prospective properties the consumer may be interested in purchasing. Information (including measurements), regardless of source, is deemed reliable but should be independently verified and confirmed. No guarantee, warranty or representation of any kind is made regarding the completeness or accuracy of the information and Compass expressly disclaims any liability in connection herewith. If you believe any FMLS listing contains material that infringes your copyrighted work please click here to review the FMLS DMCA policy and learn how to submit a takedown request. © 2019 GAMLS; FMLS. Date last updated: 04/17/2019 03:12 PM.